Manchester. Funny place. It’s a big, spread out kind of city and one that, to be honest, I’ve never really got along with that well. My first ever visit saw me deposited at the bus station (the trains were cancelled) in a less than salubrious part of town. And that has pretty much typified my experiences since: you can find the shiny shops and bars but, just as easily as you found them, you can find yourself in a street that looks and feels decidedly down at heel. As we were scheduled to arrive in Manchester at around 7am, we knew we needed to have a plan to fill the afternoon, in order to get ourselves on UK time as soon as possible. Fortunately, a good few years food blogging while living in Leeds meant I knew where to start – by asking Alistair Bathgate. Good food, good surrounds, a decent wine list and (of course) toddler friendly were all on my list of requirements. 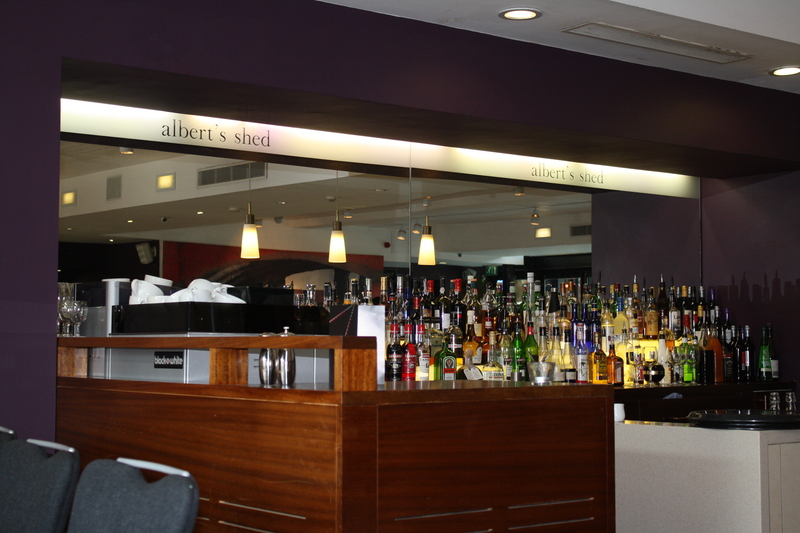 We had a short list of two, which was whittled down to just one, Albert’s Shed, by the fact that we could get off the train at Manchester Piccadilly and walk there (thanks to the free wifi of various venues on Deansgate Locks because otherwise we might not have found it!). Albert’s Shed is on the canal and has a spacious beer garden. Inside, it’s neutrally stylish and massive windows do a fantastic job of catching weak early winter sun and turning the dining area into a comfortable, light filled space. We were warmly greeted, given a choice of tables and offered a high chair. Without asking. And without asking the Toddler was presented with colouring sheets and crayons. Before we even sat down, I was Albert’s Shed newest number one fan. I really enjoyed the risotto – the rice had a good toothsomeness to it, there was plenty of fish but there was no overpowering smokiness, and the perfectly poached egg added extra creaminess and richness. Popping a poached egg on top of risotto is something I certainly need to do more of! The fish cakes were good too – quite generous in size, with a lovely crispy outer and the right combination of fluffy potatoes and fish in the inner. I didn’t get to try any of the burger, but the fact that it was huge and there were no complaints from the other side of the table suggests that there were no issues there. Drinks wise I started with a glass of the house Pierre Mignon Champagne. If Champagne is on offer for 6.95 a glass, I’ll be having it, thanks. It was pretty indifferent Champagne, if I’m brutally honest, but at that price my expectations were limited to something cold and fizzy! I followed this with a small glass of Airen (4). Airen is the most widely grown grape in Spain and is mostly used for the production of Spanish Brandy. It makes a reasonably neutral dry white wine – a little bit of weight, a little bit of stone fruit … Not the most interesting wine you’ll ever drink by the glass but also one you’re not likely to find on wine lists in Australia! The toddler wrapped up with a bowl of fruit and we finished with coffees. The damage was 50 – that’s for 2 adult main courses, 2 glasses of wine, 2 beers (Andy was thrilled that Budvar was on the menu! ), 2 coffees and the children’s menu. Probably not the cheapest lunch you can have in Manchester but certainly a very very pleasant lunch. 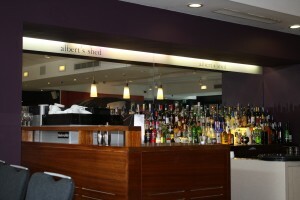 Food, wine and venue all ticked the right boxes but the real stars at Albert’s Shed were the staff. Absolutely everyone on the floor was unfailingly polite, ccompetent, cheerful and thoughtful.